Pregnant Gisele Bundchen Visits The Patriots Training Camp With Ben & John! 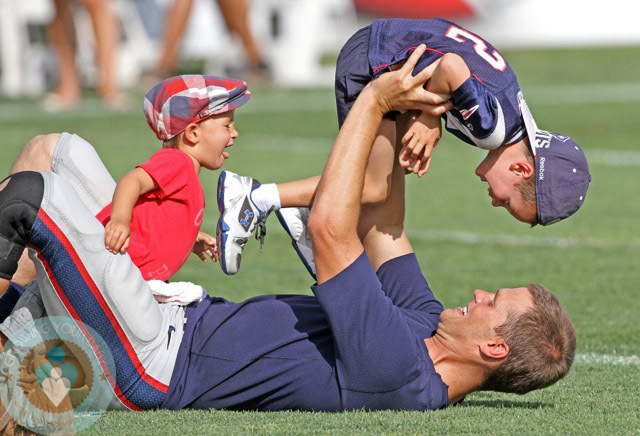 Home » Pregnant Gisele Bundchen Visits The Patriots Training Camp With Ben & John! Tom Brady was all smiles yesterday while getting a visit from his wife Gisele Bundchen and their boys Benjamin and John(with former partner Bridget Moynahan)after the New England Patriots football training camp at Gillette Stadium. Super daddy fan, John was dressed in head-to-toe Patriots gear as he rough housed with his dad and brother. Ben showed his support in a vintage Pats tee and newsboy cap. Mom-to-be Gisele sat on the turf with her boys chatting with Tom while he managed the chaos. The happy family wasn’t alone for their playtime. The Patriots set a new record for attendance at Gillette Stadium yesterday with almost 15,000 fans on hand. Kristin Cavallari & Jay Cutler Welcome A Baby Boy!